Irrigation systems that keep track of rain and soil conditions and irrigate appropriately are a very cost-effective way to reduce outdoor water consumption. These systems can reduce water use by more than 25 percent without any other changes to the landscaping or water systems. There are two types of automatic irrigation systems that are generally considered "smart." Rain monitoring systems use precipitation monitors to keep track of rain events, turning the irrigation timers off during and after rainfall. These are relatively unsophisticated but simple systems that save water and keep the sprinklers off when it rains. Evapo-transpiration monitoring systems in combination with rain sensors are more complex, keeping track of precipitation, soil moisture, upcoming weather, and landscape water needs, to define a dynamic irrigation schedule that optimizes water use. 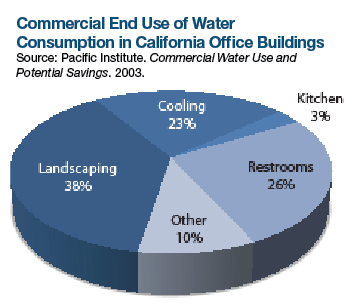 These systems are more expensive, but can save much more water. Water savings from switching to an evapo-transpiration/rain monitor system range from 30 percent in areas with more rain to more than 60 percent in drier areas. 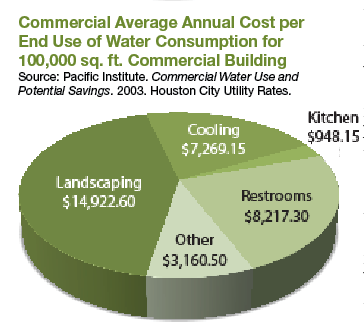 In a sample 100,000-square-foot building, this would translate to cost savings between $4,500 and $8,500 annually. In combination with a drip watering system, the savings could reach 75 percent, or $11,000 per year. Luckily, costs for these systems are approximately equal to one year's worth of savings. Commercial monitor/controller systems for a hypothetical 100,000-square-foot office building might cost between $7,000 and $12,000. Drip irrigation system costs will vary greatly, depending on the landscape layout, but a whole system should cost approximately $15,000 for a reasonably complex system at this scale. The third strategy to reduce municipal (or potable) water use in landscaping is to enhance the use of rainwater in the landscape. Enhancing rainwater use can either be through collection or through re-direction. 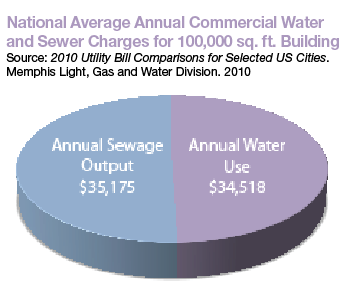 Rainwater collection systems can be expensive to implement on a large scale. However, in a low-water irrigation setting, the scale of necessary rainwater collection can be reduced, along with the cost and complexity. The other approach to using rainwater for landscape watering is to design the landscape to collect and distribute rainwater itself. This approach is called "waterwise landscaping," and emphasizes plant groupings and placement to make the best use of the flow of rainwater around a building. The approach is not focused on water collection so much as managing the movement of rainwater through a landscape. A full package of water-use improvements might include changes to the landscaping to reduce the need to irrigate, a smart irrigation system to handle the reduced need, and a rainwater collection system to provide all of the water for irrigation. This may sound exotic, but it is relatively easy to implement. There are a few issues that facility managers will need to overcome when trying to change landscape maintenance and irrigation systems. The biggest problem is that these jobs are generally done by a separate subcontractor that may have no exposure to your conservation goals. The landscape maintenance crew does not pay the water bills, nor do they typically have any idea how much water they use. The landscape planning team may understand how their designs affect stormwater run-off, but they do not experience it and they have no relationship with the municipality that manages the storm sewers. One solution to these problems is to have a member of the facility management team take responsibility for conservation and environmental impact at the property. This might seem to be one more added expense, but the savings from conservation can help support the added time. 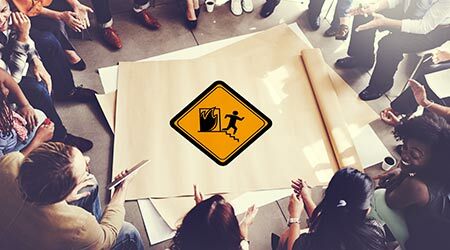 This also presents an opportunity to engage the building operations team, even a part-time team, in the quality of operations. This engagement can pay dividends for many years to come. Jim Newman, LEED AP, (jim@linneansolutions.com) is a founder and director of metrics of Linnean Solutions, which provides monitoring and benchmarking of energy, environmental impact, and community impacts for companies, non-profit, and governmental organizations. Mr. Newman has more than 20 years of experience in the presentation of complex information for decision-makers.